The upcoming Microsoft Lumia 1330 has just surfaced in the GFXBench database. 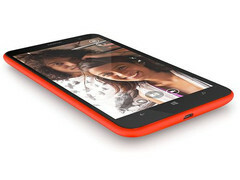 The leak reveals specs such as a Snapdragon 400 chip and a 5-inch 720p display. The first time we've heard about the Lumia 1330 was last week when two variants of the smartphone were reviewed by the FCC. 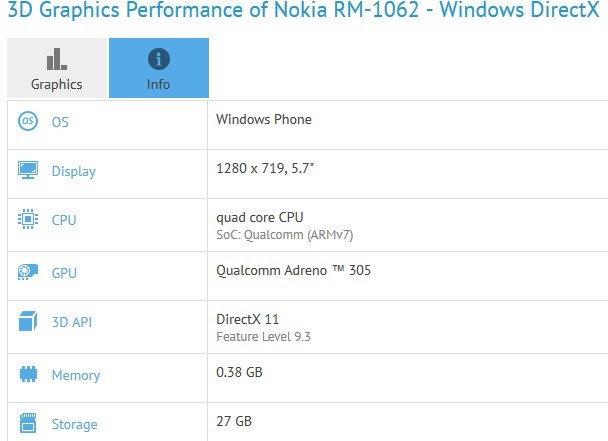 Today the Microsoft phablet was spotted on the GFXBench website, complete with most of its technical specifications. The GFXBench listing reveals that the Microsoft Lumia 1330 will feature a 5.7-inch display with a resolution of 1280 by 720 pixels. The processing power is ensured by a Qualcomm Snapdragon 400 chipset (quad-core CPU, Adreno 320 GPU) paired with 1GB of RAM. In the camera department, the Lumia 1330 will come with a 14MP primary camera with PureView technology, while the front-facing secondary camera is a 5MP sensor. The Lumia 1330 will feature 32GB of integrated storage space, probably expandable through a microSD card slot. Although affordable smartphones are the segment where Windows Phone seems to be at its best, some have been waiting for a Windows Phone flagship for quite some time now. Last week when the handset appeared in the FCC database, we learned that Microsoft will make two versions of the handset, one with a single SIM slot, and one with dual-SIM capabilities. At the moment, we don't know when Microsoft plans to unveil the Lumia 1330, but there's a good chance for the phablet to be introduced in early March at the 2015 edition of the Mobile World Congress in Barcelona.